how to make healthful non-sugar FUDGE using DATES as sweetener. A LOT of people get comfort and joy from chocolate. GOOD, it's a healthful food, high in anti-oxidants. It's one of God's greatest GIFTS to Eden. What's more, Chocolate can't hurt a fly, unless you use it late in the day or at night when it WILL interrupt sleep as it has alkaloids that stimulate. But in morning, midday, it is a fine food eaten alone. Not with a protein meal! It's 10 a.m. or 4 pm food! If you think you're getting too much sugar with the chocolate you love and have vaguely considered quitting, don't throw the baby out with the bathwater! Switch to sugar free chocolate and have as much as you NEED. In this recipe, fresh dates are used to sweeten chocolate. This makes a healthy cookie. I defy anyone to guess what was used to sweeten it. Remember - - - "STRESSED" spelled backwards! is "DESSERTS"
RECIPE's INGREDIENTS: butter, vanilla, bakers' chocolate, cream, dry milk powder, and 20 medium sized dates. 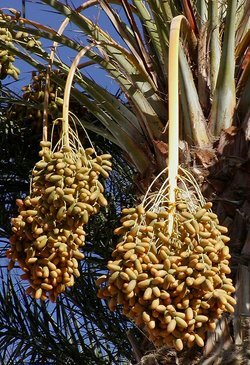 Take dates and slice them lengthwise then place them in a cup then cover with water, leave covered with pure water for 30-60 min. Drain water, then take dates and open them up and scrape interior fibrous flesh out. Place on plate and use a paring knife to mince up the dates. (Have a seat while doing this, It takes a while) You should then have date paste for mixing into chocolate mixture. * NOTE: if milk allergies, use ground up plain vanilla healthfood store cookies made into crumbs, cream cheese too. Get inventive! And if you do, get back to me with your tips. VARIATIONS: Coconut meat, food processed? Pecans? Walnuts which you toast l0 min at low temp in oven. Or toast blanched almonds? Pulverized? (soak almonds3 hrs, peel them. Or pour boiling water on, and peel in thirty seconds. You PEEL, then dry in toaster oven on low for a half hour, then grind into powder. MODE OF ASSEMBLY: Take one large skillet or pan and fill halfway or so with water and set on low heat while you place another smaller skillet into that one creating a double boiler in which you place butter and chocolate squares. Melt down, stirring very little. Have all other ingredients ready to go so you can add them all together quickly. Stir in Half and half---then take from heat---then stir in vanilla ----then stir in dry milk powder---this takes time to stir it together into a pudding like-consistency. After this cools, Have an 8" by 8" buttered pan ready. You are now ready to mix your chocolate and your date paste together. Use a strong spoon, and use a mashing motion. This does take finger and wrist strength. But you want to mix these well together. Then mash mixture into the pan, sometimes the bottom of the spoon will work fine, sometimes you will need to use your fingers a little bit. Then cool mixture well. Maybe even freezing a while. Cut into portions that give me a one ounce dose of chocolate, freeze in plastic or foil. Because there is no sugar, you don't get that sugar headache. Just a lush HIGH from the many splendid natural alkaloids in the chocolate. This is not a negative food. The Aztecs called it CACAHUATL in their language which translates to FOOD OF THE GODS. Spanish took this concept and translated this into Greek roots as THEOBROMINE, THE FOOD OF THE GODS. This recipe feeds the GOD WITHIN who's doing all that GOOD work and deserves a reward SO GO FOR IT. Double the recipe and feed a few godly friends. Keep it wrapped air tight in fridge. Our 'POSTER-BLOGGER' is ANITA SANDS HERNANDEZ, Los Angeles Writer, mother of 4, also a career Astrologer. Catch up with her websites TRUTHS GOV WILL HIDE & NEVER TELL YOU, also The FUTURE, WHAT'S COMIN' AT YA! FRUGAL LIFE STYLE TIPS, HOW TO SURVIVE the COMING GREAT DEPRESSION, and Secrets of Nature, HOLISTIC, AFFORDABLE HEALING. Also ARTISANRY FOR EXPORT, EARN EUROS....* Anita is at astrology@earthlink.net ). Get a FREE natal horoscope "my money/future life" reading now + copy horoscope as a Gif file graphic! No smarter DESTINY reading out there anywhere.